During the Great War the issue of cold weather gear for troops in the front line was limited. In the British Army soldiers had a leather jerkin and greatcoat but as the Northern French winters got colder – it dropped to more than -20 on the Somme during the winter of 1916/17 – a great deal of improvisation took place. This photograph, dating from 1916, was taken in a French photographer’s studio in a back area on the Somme front. 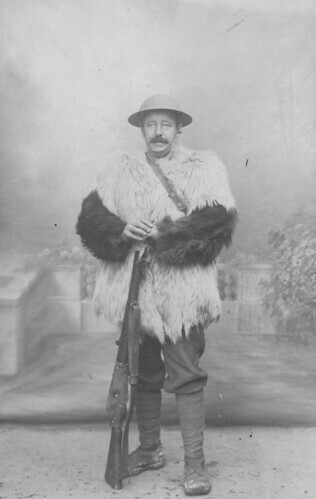 It shows a typical animal fur jacket worn by British troops; in this case with a separate over jacket and arm pieces. It was likely made from sheep or goat fur. While these were warm, they were also breeding grounds for body lice and while extensively used in the early war period, they were less common as the conflict progressed. The soldier also wears a British steel helmet, standard issue by this time, and the strap across his fur jacket is from the small haversack which contained his gas mask, likely to be a PH Helmet at this stage. His Short Magazine Lee Enfield (SMLE) Rifle has a cover over the main working parts to protect it from the elements. Images like this are rare, especially those taken in studios, and it gives as an insight into what British troops wore during some of the winter periods. This entry was posted on 08/12/2012 by sommecourt. It was filed under Behind The Lines, British Army, France, Great War, Somme, Western Front, WW1 and was tagged with 1916, British Army, Somme, Tommy, Uniforms, Winter, Winter War. I think I have something similar in my wardrobe. Very interesting post, as always. I hadn’t considered the possibility if him being in the AIF. Do you have a photo to compare? I am organising a ‘line up’ of the photos which I have. However, some are best seen on Australian war websites as the photos are very small as is yours when saved. a bit messy . I have loaded your photo of a soldier in winter kit and my other photos of my great uncle on my website. No idea I’m afraid, except its in France. Could you give me a bibliographic reference for the photo, please? The AWM is still interested if I can find the source. All the images on this site are scans of originals held in my own private archives. I’ve been collecting them for over 30 years. I don’t scan images from books and post them, that would be dishonest. So I don’t have a bibliographical reference to give you as this image is a primary source in terms of historical study. Many thanks once again for your reply. I appreciate your help. I am trying to explore any avenue I can find to identify the soldier as I know it is important for many people and especially Charlie’s family. He ended up being a very lonely old man who lived in a series of old soldiers homes in Brisbane until he died in 1965. These days, his behaviour would be called PTSD but in the 50s he would appear in Sydney for a few days and leave again for Queensland. He was a loner. He had quite a brutally honest account of his military record written into a county archive in Ireland. Unfortunately, the anonymous writer included his failings but did not record any of his bravery and skills. He became a Lewis gunner and instructor and soldiered on all over the Western Front after he had been at Gallipoli from early May 1915 until the evacuation. He was then in Egypt and North Africa before going to Marseille and onto the front. My brother and I are trying to gather everything we can to rectify the glib report which is in the county archive. It would be a fitting tribute to him to have it done for the centenary. Given that the Australian War Memorial is prepared to help me identify Charlie in uniform and given that we have only one family photo in existence of him taken during the second Boer War and that identification is also a major aim behind the Vignacourt photos, I would like to try to have a chance to do him some honour. I am not challenging your honesty in any way. I have respect and admiration for all that you have done to honour the Diggers and bring Vignacourt to light. I am just trying to shine a beam on Charlie and his bravery. We also have one photo of his only other brother, Myles who went to WWI from Queenland. The enlisted a few weeks apart in different tows and both ended up in the 49th Battalion. Myles was killed at Broodseinde on 4 Oct 1917. He received the DCM for gallantry under fire on 25 August 1916 at Pozieres. We will donate this photo to the AWM and would like to be able to do the same for Charlie…..in uniform.